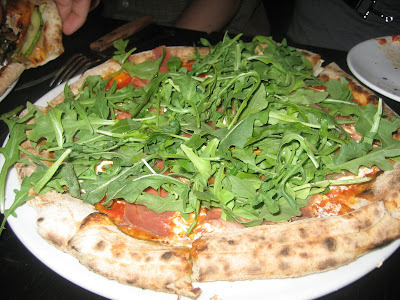 Recently a couple of Pizza Club members gathered at Tonda in the East Village for a meet-up. The restaurant opened earlier this year in the space formerly occupied by E.U (See: Tonda Opens In East Village). The space is like no other eating establishment I’ve been to — oddly divided up into different sections. This provides diners, and especially larger groups, with the opportunity to eat in a semi-private setting depending on the size of their party. This seems to be going against the NYC restaurant trend of sitting diners on top of one another. Last week, my mother and I went to Graffiti and we were sandwiched between two couples! Awkward. At Tonda, our party was seated in a section right in front of the bathroom, which was cool if not for the fact that we saw a couple of people walk in on strangers while they were doing thier business! I was seated on a couch, which felt a bit odd at a restaurant, but considering I usually eat in my bed, it shouldn’t have felt so off. We ordered six pies. Each was solid. 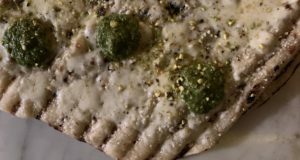 None were mouth watering or mind blowing. 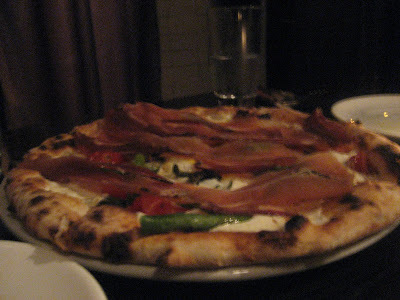 But their $30,000 slow-rotating 1,000-degree wood-burning pizza churns out some tasty pizzas. 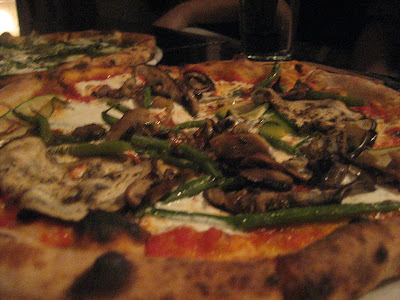 I think my favorite was the Quattroformaggi (gorgonzola, caciocavallo, mozzarella, parmigiano) followed by the Vegetarian (tomato, mozzarella, eggplants, mushrooms, zucchini, haricots verts). 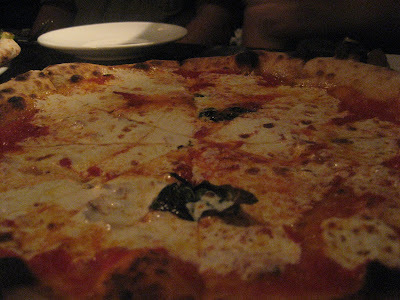 The Margherita left something to be desired when compared with pies at Co. and San Marzano. 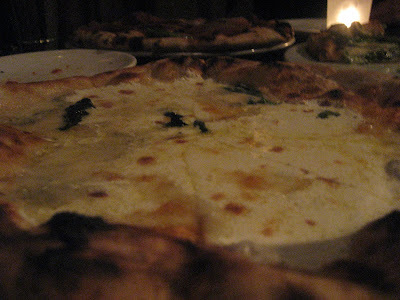 Below are photos of the six pies we ate. 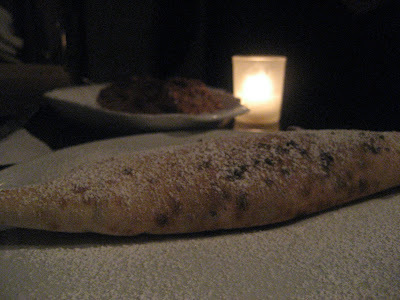 The highlight of the meal for most of our party seemed to be dessert – particularly the nutella calzone which melted in each of our mouths. 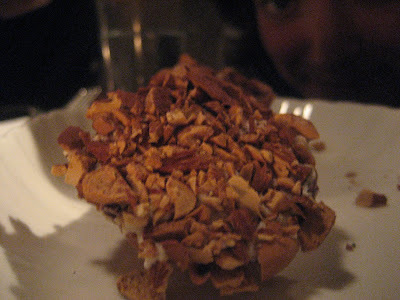 The cannolis were also large and topped with nuts and other flavorful ingredients not typically found on cannolis. 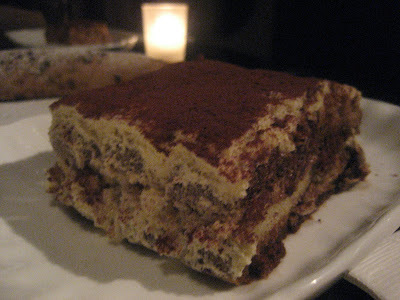 The tiramisu, although a little dry, was large and filling. 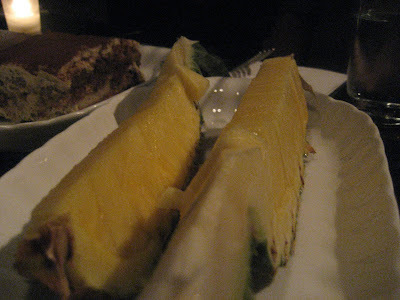 And the pineapples were fresh and tasty. I think Tonda will do well. 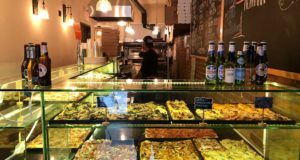 It’s pizzas are all $15 and under and the space is well designed in a highly trafficked location. They serve brunch (which I’ve yet to try) and have 26 outdoor seats (which weren’t set up when I was there due to the weather). The service was friendly and efficient. It has all the right ingredients for a successful restaurant. 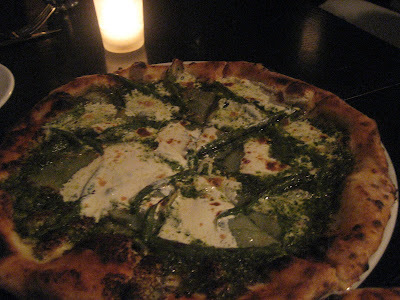 The bar has been set to high for pizza in New York. There’s nothing wrong with average. And that, Tonda is. 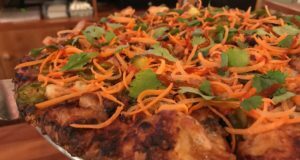 Previous: The Death Of The Slice?